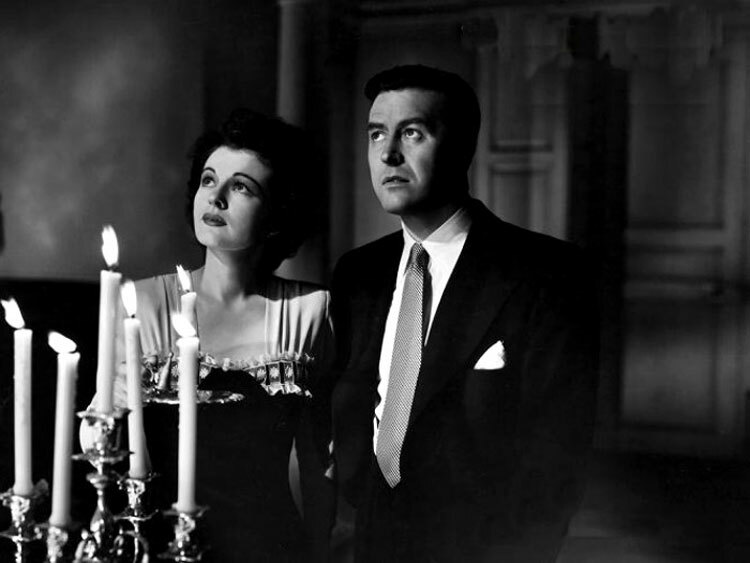 Adapted from the novel, Uneasy Freehold, by Dorothy Macardle, The Uninvited is Hollywood’s first attempt at a ‘serious’ ghost story. When siblings Roderick and Pamela Fitzgerald (Milland and Hussey) discover Windward House on the rugged Devon coast, they have no idea what they’re letting themselves in for when they purchase it from the house’s owner, Commander Beach (Crisp). Their dog won’t venture upstairs, the studio room is unnaturally cold, and a previous resident, Mary Meredith, fell to her death from the cliff at the end of the garden. Add to this some ghostly weeping in the pre-dawn hours, the mysterious relationship between Mary Meredith and a trained nurse, Miss Holloway (Skinner), an unfolding back story involving the Commander’s granddaughter Stella (Russell) – who may or may not be the key to all the strange occurrences – and you have the makings of one of the best scary movies ever made. The movie starts strongly with an unnerving voiceover by Milland; it sets the scene perfectly for the events that follow. Once the Fitzgeralds have moved in the sense of foreboding is cleverly and effectively evoked, and the scenes that increase the tension are well-played and directed. The mystery elements are handled with aplomb, and the unfolding of the back story involving Mary Meredith, Stella and Miss Holloway is absorbing and intelligently revealed. The movie uses humour too to underpin the sense of unease, and in Milland’s practiced hands, it’s never over-played or becomes grating. As the movie plays out, the tension thickens until the truth of what really happened in the past is realised, and the showdown with the ghost of Windward House grips like a vise. 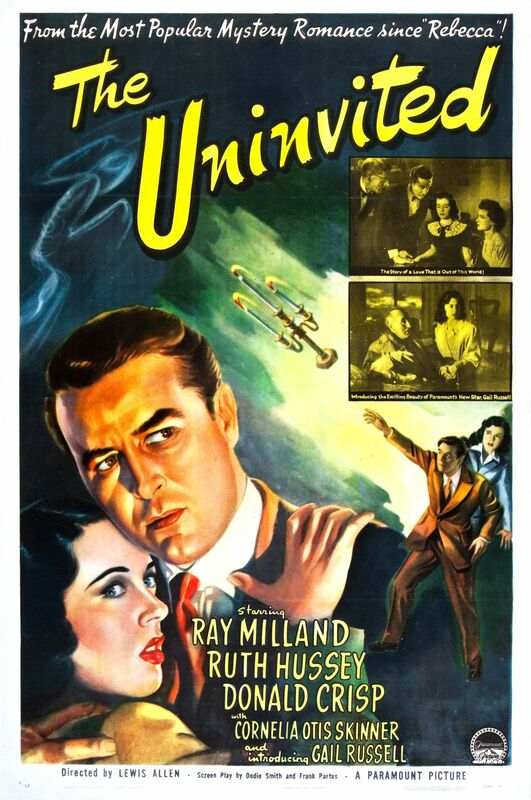 The Uninvited is a great movie, superbly and confidently directed by Lewis Allen, with an often chilling, evocative script by the playwright/novelist Dodie Smith (The Hundred and One Dalmatians) and Frank Partos. The roles are well-cast: Milland and Hussey are credible as brother and sister, while Russell excels as the focus of the haunting (sadly, Crisp was distant to her during filming: this was only her third movie and he felt she was too much the amateur). Skinner adds an exotic, otherworldly presence as the trained nurse who knows more than she’s telling, and there’s further comic relief from Barbara Everest as the Fitzgerald’s Irish housekeeper Lizzie Flynn. There’s striking, atmospheric cinematography courtesy of Charles Lang, and a playful yet dramatic score by Victor Young that includes the now-classic composition Stella by Starlight. But it’s art directors Hans Dreier and Ernst Fegté who deserve the most credit, for creating a haunted house that is open and airy and devoid of the usual dark corners and hidden passages that were the staple of previous haunted house movies. It’s this ‘ordinary house’ approach that helps ground the scares when they happen, and which makes for a refreshing change after all the old dark house movies of the 30’s and early 40’s. Rating: 9/10 – a classic tale that is as fresh today as it was on first release, The Uninvited remains one of the best ghost stories ever committed to the big screen; recommended viewing. Shelton’s follow-up to Your Sister’s Sister is a disappointment in comparison, focusing on the problems of massage therapist Abby (DeWitt), her brother Paul (Pais) and his daughter Jenny (Page). Abby is afraid to commit to her current boyfriend Jesse (McNairy); her anxiety over this leads to a sudden aversion to skin, and to touching it. Conversely, her dentist brother finds that he may have “healing hands” and begins to explore this further with the help of Abby’s mentor Bronwyn (Janney). While all this is going on, Jenny struggles with her need to help her father at his practice and her desire to move on to college. From the start this is a movie that lacks focus. The opening scene introduces the main characters, and while we realise that each has their own problem, the banality of those problems stop them from being interesting: Abby’s commitment issues, Paul’s insular view of the world and the people around him, Jenny’s need to seek new horizons, and Jesse’s lack of ambition – we’ve seen these issues a thousand times before. 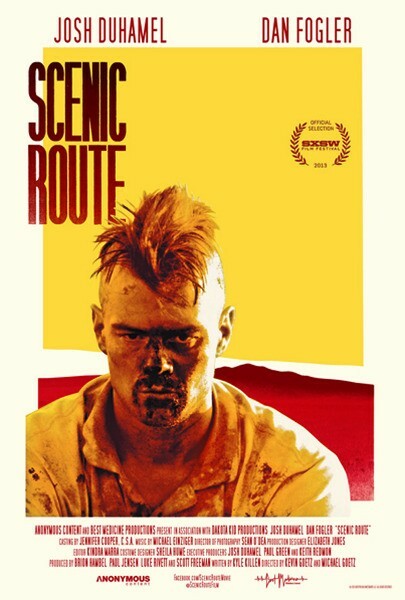 But where we might hope for a new take on all this, and for the movie to take us in directions we haven’t seen before, instead, Shelton’s script takes us on several unrewarding journeys that all end with pat and distinctly underwhelming resolutions. There’s also a major issue with the movie’s timeframe: Paul’s conversion to Reiki therapy obviously takes place over at least a matter of weeks, but in the meantime the other story lines remain held in stasis. When they do resume it’s as if only a day or two has passed. The cast do well the lacklustre script, Pais in particular, who creates a quiet man-child entirely comfortable with stifling his daughter’s ambitions, while DeWitt and Page cope with roles that are clearly underwritten. Of the supporting cast, McNairy has the thankless role of confused boyfriend, while Livingston pops up in the background of a couple of scenes until he’s wheeled centre stage for a sequence near the end that feels as contrived as it looks. Shelton directs ably enough but there’s too little drama to really hold the interest throughout. There’s not enough real angst to get your teeth into. The film is also drab to look at, its Seattle setting doing nothing to enhance the mood (though it does match the characters’ unhappiness). That said, DoP Benjamin Kasulke frames each scene well and makes the often static shots more interesting than they have a right to be. The film moves at a deliberately slow pace, and while that’s not necessarily a bad thing, here it just adds to the disappointment at having to spend time with a bunch of humourless malcontents. Hopefully, Touchy Feely is a blip in Shelton’s directorial career, and her next feature, Laggies, will show a return to form. It’s a good time for female directors and the more we see from them, the better. Rating: 5/10 – a soggy, undercooked mess of a movie saved by its cast and a just-about-right running time; for Lynn Shelton completists only. And so, here we have thedullwoodexperiment reincarnated as a blog. There’ll be more reviews covering a wider selection of movies, and hopefully, posts that will comment on the past, present and future of cinema. My hope is that people will find thedullwoodexperiment an enjoyable place to visit, and that the reviews will trigger a degree of debate.